These are gorgeous! LOVING the colors and love love love love the trees!!!!!! Two beautiful cards and tags. Thanks for sharing with us this month at Silhouette Challenges. Tags are too cute. love the colors and cute tree.The card is stunning. The trees are fabulous and lovin the snowflake. You rock my friend. 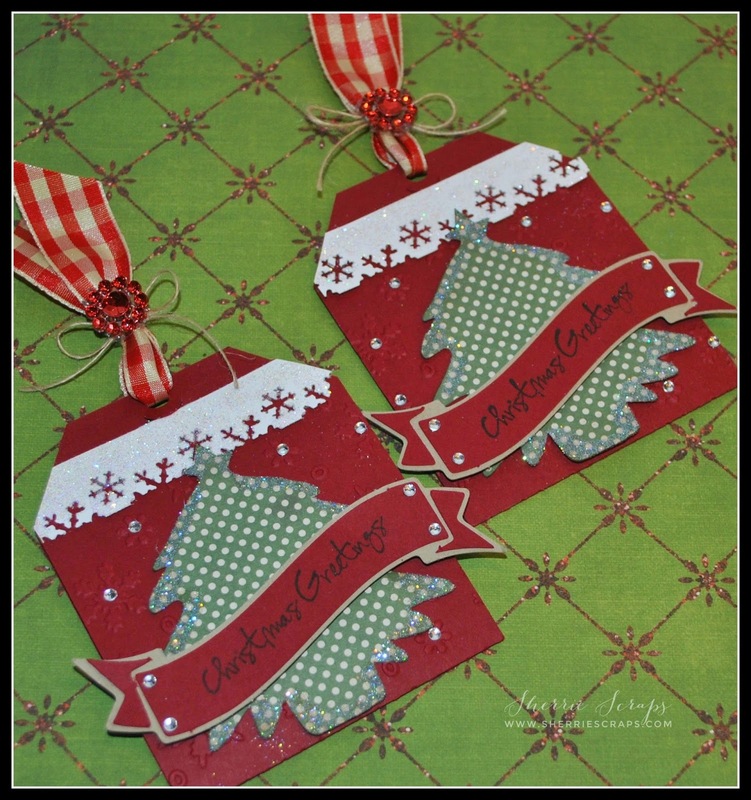 Love the tags and the Christmas tree card... Gorgeous! Your tags are so beautiful, Sherrie!! I love the sparkly snowflake border and the pretty ribbon!! The card is absolutely gorgeous!! Those trees are fabulous!! That die is on my wish list!! All of the details you added are perfect!! Awesome job on everything my friend!! Congrats on you gast DT spot!!! Your card and tags are beautiful!!! Love the pretty paper you used!! Have a great day. Oh gosh, Sherrie! 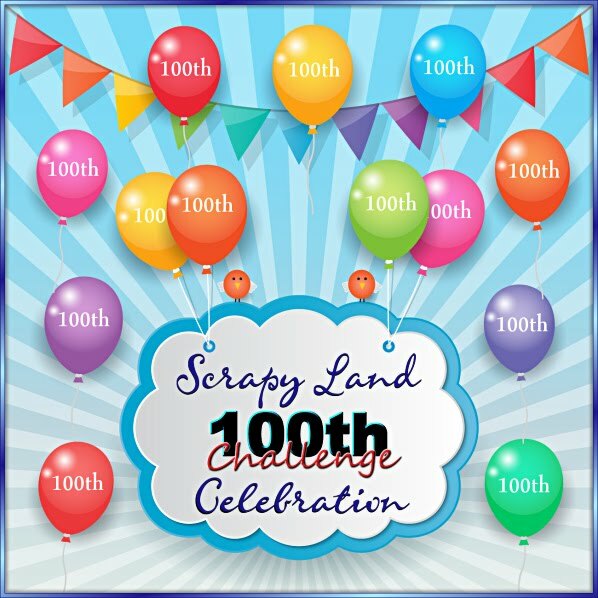 You have been such a fantastic, guest at Sweet Stamps..I'm loving yet another of your creations! Your tags are so pretty and your card is amazing. Love the trees, your snowflake and that pretty bow. Fabulous way to show your holiday spirit. Both projects are just fabulous, but I especially love those trees on your card. Both of these projects are just gorgeous my friend! I absolutely love your gift card holders, they are small, cute and definitely fit for the Holiday! Your card on the other hand, just LOVE it! Love those trees and that pretty font in that sentiment! 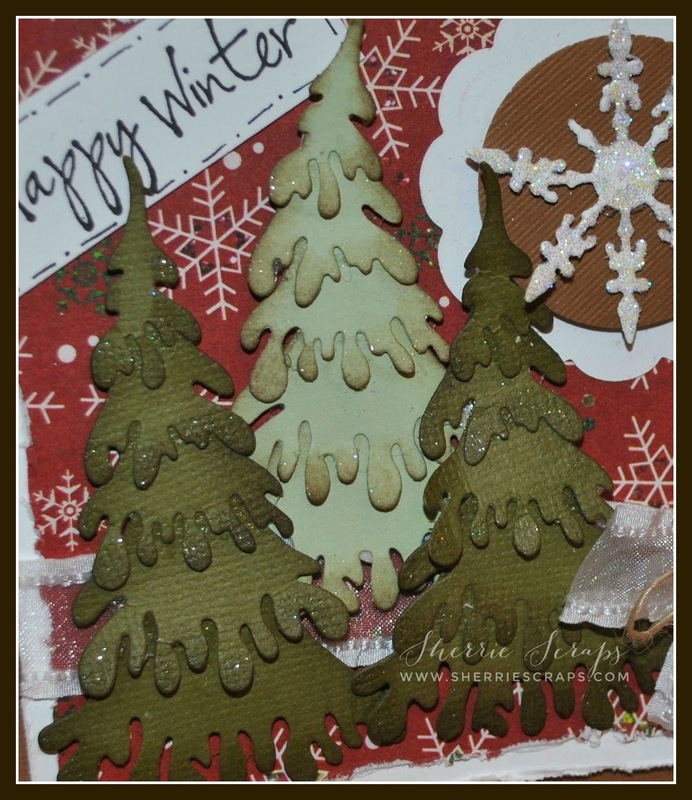 wow love those tags and the card is amazing..those trees are awesome.. great designing.. Your gift card holders are absolutely adorable, great idea to make a couple of them to have around! I also love your Christmas card, those trees are just fabulous! Love the dimension to them and the touch of sparkle is just perfect! I do love to bake during the holidays and hope to get some baking time in over the next couple of weeks! 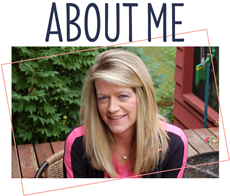 Sherrie, I'm in love with your projects!! Your tags are so sweet! I love the Cherry Cobbler/Crumb Cake combination. Your ribbon/string combination is fabulous! And your sweet little cards are amazing!! I LOVE those trees!! As for baking... I do far too much!! I'm like you and love holiday baking. Everybody has their favourites and I can't disappoint, can I?! I enjoy putting trays of goodies together to share. Even though I give so much away, we're usually still enjoying treats well into the new year too! Happy baking to you!! Both your projects are precious. 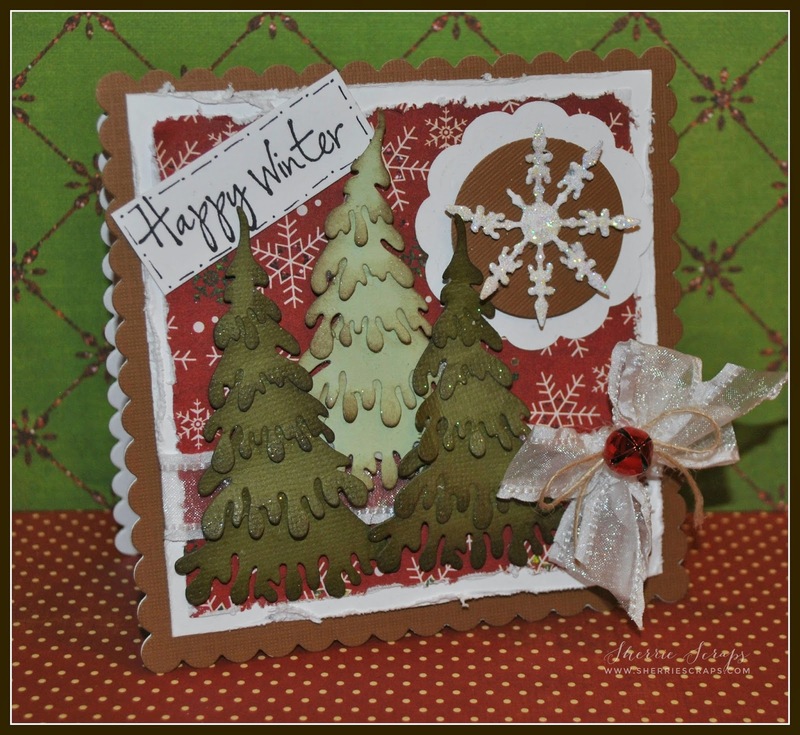 Loving the trees on the card...neat looking die cut. Wonderful creative projects. 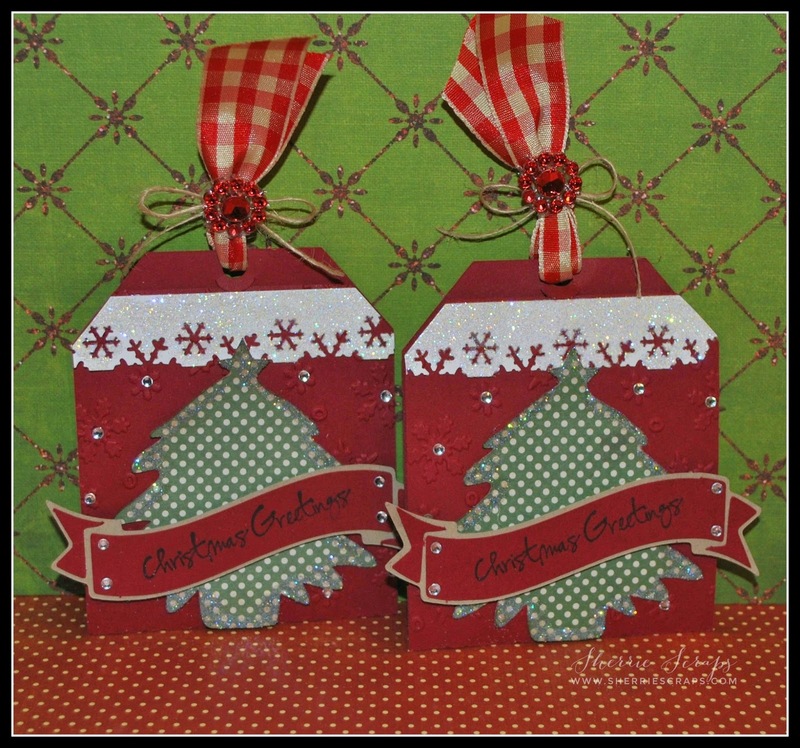 Love the combination of silhouette cut tag, punches, lots of glitter and fun Christmas creations! 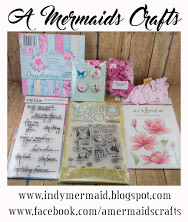 So glad to have you here as GDT at Sweet Stamps! Well hello Miss Sherrie! Your gift card holders and sweet sparkly card are just FABULOUS! Perfect colors for the tag - love the gingham ribbon and the trees on the card are SUPER!!! These are all beautiful but I especially love the card! Beautiful! Thanks for joining us at My Sheri Crafts! I love the giftcard holder tags. Those sparkly gems are really pretty. These are so AWESOME!!!! 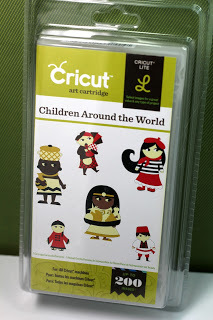 LOVE those fun tags and your card is AMAZING!! Gorgeous tags and a BEAUTIFUL card my friend!! These are sooo pretty !!!! I love both of your creations !!!! 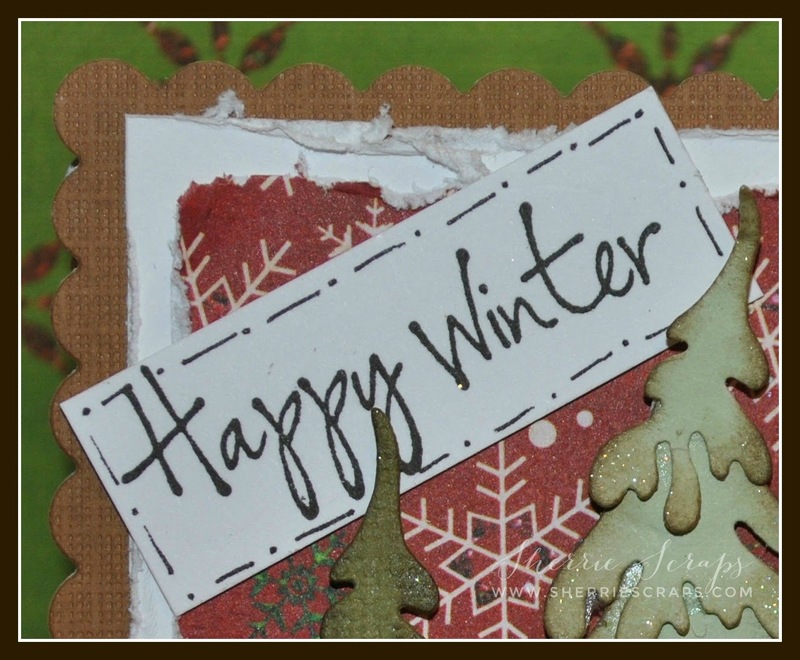 Love the tags and the card - great creations!! 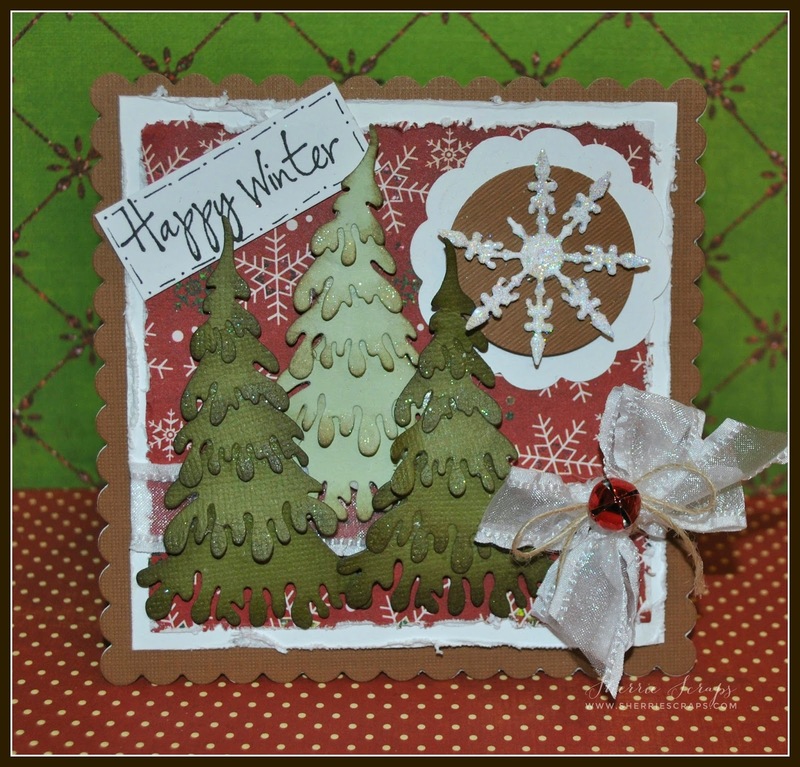 Thanks for linking them up with us at Craftin Desert Divas "Christmas" linky party! Wonderful work as always my friend! I love the sweet tags with the pretty gingham ribbon. And, your card is beautiful, I love the layers on the trees. You've added the perfect accents and embellishments to bring it all together!